The health and wellbeing of volunteers/recreational walkers is a priority issue for the Friends of the Heysen Trail. Australia has the highest rate of skin cancer in the world, with two out of three people experiencing some form of skincancer during their lifetime. The Friends of the Heysen Trail acknowledges and recognises that skin cancer is a preventable disease and will actively promote, encourage and support skin protection at all walks, projects, events, activities and functions with which they are associated. Schedule walks, projects, activities, functions and events to avoid some if not all of the peak ultraviolet period (11am to 3pm daylight saving time) or between 10am to 2pm. Where possible, rotate volunteer duties to minimise time exposed to UV (volunteers will be encouraged to schedule their own duties to minimise time exposed to UV). 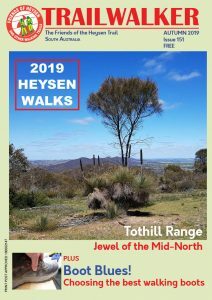 The Friends of the Heysen Trail will ensure that clothing sold in relation to any promotions will include sun protective alternatives such as shirts with long sleeves and broad brimmed hats. Actively encourage and remind volunteers/recreational walkers to bring their own shade structures to events, eg umbrellas. The Friends of the Heysen Trail will endeavour to provide temporary shade where adequate shade is not provided for in key locations such as eating areas and event start/finish areas. Actively encourage all volunteers/recreational walkers etc to routinely use broad spectrum water resistant 30+ sunscreen and stress the importance of regular reapplication (at least every two hours). Provide and/or sell sunscreen for events/activities where possible. Promote sun safety through event advertising, newsletters, brochures and over the public address system where appropriate at events. Actively encourage appropriate volunteers in prominent positions to be SunSmart role models during all highly visible activities. Advise all volunteers/recreational walkers etc about the SunSmart Policy and encourage them to comply with it. This Sun Smart Policy will be reviewed annually to ensure that the document remains current and relevant. Last reviewed and re-adopted at 18th April 2007 Council Meeting.